Introducing our brand new range Monkey Glasses! 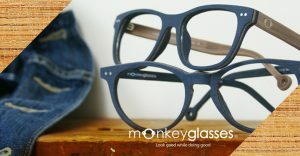 Monkey Glasses are made from a special biodegradable material to make their frames look like wood, horn and crystal. Monkey Glasses are made from cotton acetate, this is a special kind of plastic which consists of approximately 95% cotton flowers and wood, the raw material is biodegradable. Each frame is hand made, so is handled more than 200 times in production. Along with being a biodegradable material Monkey Glasses focus on producing as little waste as possibe. Most of the waste from producing a pair of spectacles is recycled and made into accessories such as; keyrings, bracelets, earrings etc. All spectacles come with a hardcover case which is made from recycled paper and can along with a cleaning cloth be folded flat when not in use. Only 266g of CO2 is created when producing a frame.